Every time I fly back into Seattle, I hope to catch a glimpse of Mount Ranier from the plane. I know to sit on the left side and I always want a window seat. If I’m lucky, it begins to loom on the horizon after crossing over the Cascades, and shows up as the plane is descending into Seattle. Sometimes, it is invisible, shrouded in fog and clouds. Every once in a while, it is huge and shining and the air all around it is clear and sweet. For me, it means that I am almost home. And seeing this glorious mountain reminds me of the power and sanctity of nature. On Monday, I was flying back from Chicago and there it was. This time, the clouds did not surround it completely, but only allowed its shape to emerge ever so slightly through the window of the plane. I decided to take a few pictures anyway, thinking that maybe they’d be better than I thought. The pictures looked fuzzy and Ranier was barely visible. But even though the mountain didn’t look like much in the camera, I downloaded the pictures anyway. Then I started to play around, cropping a little, playing with contrast, saturation, light and dark. Left a little tilt to the photo, so the idea that it was taken from a plane is obvious. Finally, I made the image black-and-white. 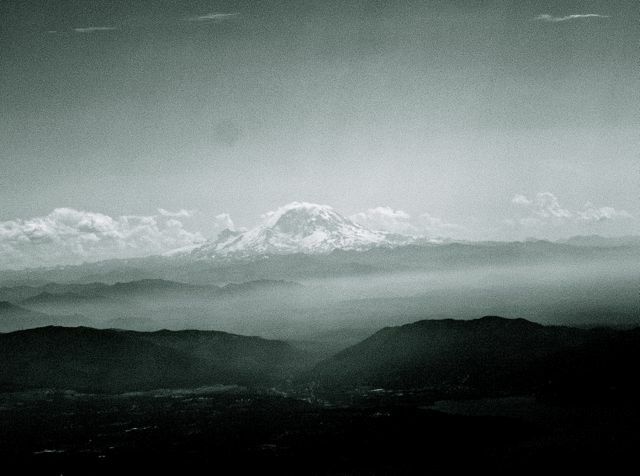 The horizontal chain of mountain and clouds is still merging into one another, but Ranier can hold its own. Just a fun exercise. To get a grand view of a grand mountain, well worth the effort.